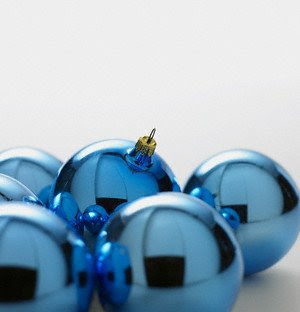 With so many parties and festivities, the holiday season can by joyful and special, but also overwhelming and stressful. Winter depression, also known as Seasonal Affective Disorder (SAD), affects many with feelings of sadness, loneliness and irritability at this time of year. If you or someone you know seems to be experiencing extended sadness, fatigue, lack of energy or increased abuse of drugs or alcohol during the holidays, the Pasadena Public Health Department urges you to call a medical or mental health provider right away. There are plenty of local resources, including Pasadena Healthcare Link, a 24/7 information line at (626) 744-7445 that can help you find the assistance you need. Our Recovery Center, an outpatient drug prevention and treatment program, is also available at (626) 744-6001. Well on its way to becoming a green city, Pasadena is clearing the air! Fair warning to smokers who light up along the parade route on New Year's Day: You'll be asked by a police officer to either put it out or go a block or so away from the route to enjoy your cigarette, pipe or cigar. The fine for ignoring the officer: $100 for the first violation (it goes up from there). 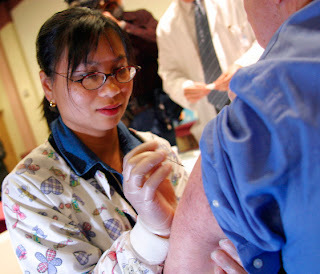 Due to newly strengthened tobacco control laws put in place in October by the Pasadena City Council, smokers throughout the community can no longer light up at outdoor shopping malls, outdoor patios at bars and restaurants, outdoor public gatherings like parades and festivals, or outdoor areas of private smokers’ lounges and tobacco shops. 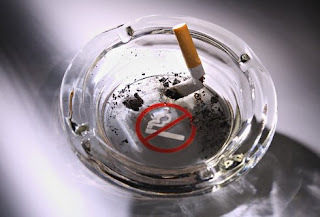 Smoking is also prohibited in or within 20 feet of an outdoor waiting line, such as a bank ATM or movie theater ticket booth, or within 20 feet of a doorway or window of a building where smoking is prohibited. Pasadena Public Health Department is spreading the word about the new law with public education and new signage. Enforcement is mostly based on complaints received. To report a violation, or for more information, call 744-6014. No, Really -- They're Free! We have received many expressions of thanks from Pasadena residents for the free energy-saving light bulbs mailed to every household last summer. Others have asked what gives with the coupon that was enclosed: "$75 in free bulbs? 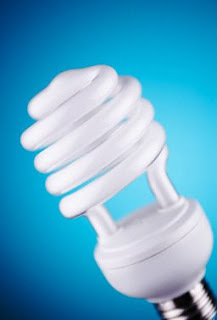 There must be a catch..."
But I happily repeat: The additional compact fluorescent bulbs (CFLs) are absolutely free. No tax, no shipping, no handling. We've done the math, and this community will come out way ahead in energy cost savings and carbon emission reductions if every household switches to CFLs. 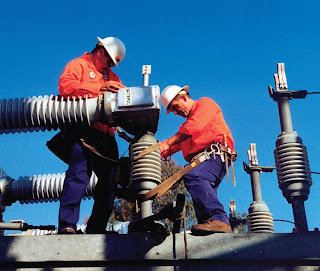 If you're a residential customer of Pasadena Water and Power, you have until the end of January to take advantage of the free CFL offer. Go here to order online or call (866) 807-1544. The paint is dry, fixtures are in and construction is complete at Fair Oaks Court, which recently received national honors as the affordable housing project of the year! Located in the heart of northwest Pasadena, the spacious complex spans almost two acres and features a blend of 31 new condominiums and nine historic, single-family homes that were recently restored. All buildings embrace the Craftsman architectural tradition. Most of the units have been purchased by first-time, income-eligible buyers; others have been purchased by workforce-income and the remainder have been sold at market rate. Two one-bedroom, one-bathroom units, built in 1919 and completely rehabilitated, are currently for sale to income-eligible buyers. In addition to providing beautiful and affordable homes, the project has spruced up the neighborhood, put existing resources to good use and preserved historic structures in the Villa-Parke area. Fair Oaks Court was developed by Heritage Housing Partners, a local, non-profit affordable housing developer, in partnership with the Pasadena Housing Department and with assistance from Pasadena Water and Power, Clearinghouse CDFI, Washington Mutual and Los Angeles County. The complex is located on North Fair Oaks Avenue at Peoria Street, 171 Carlton Ave. and 504 Cypress Ave.
To learn more City of Pasadena affordable homeownership programs, visit here or call 744-8300. 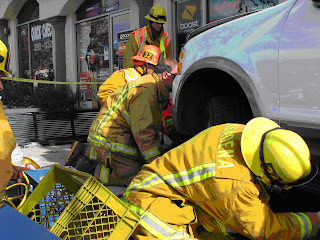 At 11 a.m. on Sunday, Pasadena firefighters responded to the scene of an accident at Lake and Orange Grove where a man was trapped under an SUV that had gone up over the curb at a bus stop. The man, who had been waiting at the bus bench when the accident happened, and the driver, a pregnant woman, were treated at the scene and then transported to the hospital. Never a dull moment for Pasadena firefighters and police officers! Be sure to thank them whenever you see them out and about. 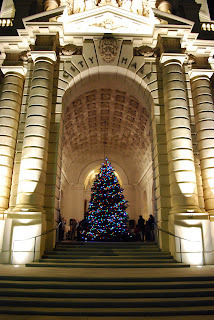 For as long as I can remember, we in the City Manager's Department have had a holiday party every year -- sometimes a luncheon with all the trimmings, sometimes an evening gift exchange, etc. This year we decided to help a low-income Pasadena family: A mom and dad with six children and one on the way. Staff in the City Clerk's Office joined in the plan. We got a list of each family member's wants, needs and desires, and then we went shopping (with our own personal money). We wrapped enough presents to make this a merry Christmas for a family that otherwise would have very little on December 25. Don't listen to the department stores that put out their Christmas trees and other holiday decorations before Halloween every year. 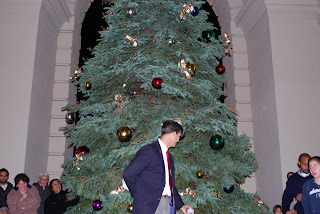 The season really, truly begins with the tree-lighting ceremony at Pasadena City Hall! 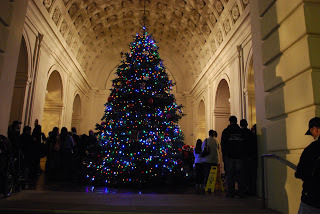 The festivities took place tonight at 5:30 p.m. in the grand entrance, where more than 100 people had gathered. The event kicked off with the McKinley After-school Chorus under the direction of Robin Turrentine. They were just great! Hundreds and hundreds of LED lights were donated by Pasadena Water and Power. They use only 10% of the energy that incandescent tree lights use, and they don't put out any heat whatsoever. A lot of people brought unwrapped gifts to put in the Pasadena Fire Department's Spark of Love boxes for needy children and teens. Drive by some night when you're in the neighborhood. The tree, in all its glory, is spectacular! There's Still Time to Throw Your Hat in the Ring! On March 10 voters will choose representatives for City Council Districts 3, 5 and 7, and Board of Education Seats 1, 3, 5 and 7. To run for one of the council districts, you must be 18 or older, and registered to vote in the specific district you're interested in. 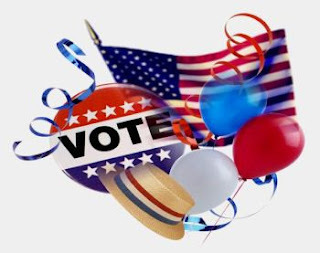 To run for one of the school board seats, you must be 18 or older and registered to vote anywhere within the Pasadena Unified School District boundaries. 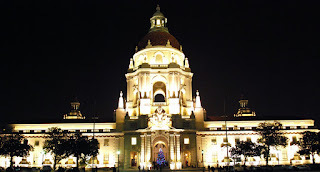 Complete and file nominating papers by Dec. 12 at the City Clerk's Office, Room S228 at Pasadena City Hall. Visit here or call (626) 744-4124 for more information. The relationship with department directors at the city and their counterparts at PUSD have been strengthened over the past couple of years, which has led to discussions about shared issues and services such as transportation, facilities, fields and security. The City Council and Board of Education have met jointly several times over the past couple of years to set priorities and policies, and the city manager, superintendent of schools and employees from the city and PUSD are carrying out that vision. And now there is a joint website that explains many of these partnerships. Click here to learn more! Back by popular demand, here are a few more of the historic photos from the mid-1920s when our beloved Pasadena City Hall was under construction. Pasadena Girl Scout Troop 4051 of the Mt. Wilson Vista Council visited City Hall today. I introduced them to some of Pasadena's finest, who talked to them about safety and what's involved in firefighting. Here are firefighters Jerry Kenoly (left) and Amo Avakian holding the girls' attention. Each of the girls got to try on the heavy protective clothing that firefighters wear. Before we left the firefighters, each of the girls got a stick-on firefighter badge. Then we headed up the stairs for a quick tour of City Hall and a look at some of the architectural features of the building's exterior that symbolize strength, abundance and water. I love my job. I work very hard in my office and in the community every day, and the tours with children make it all worth it. 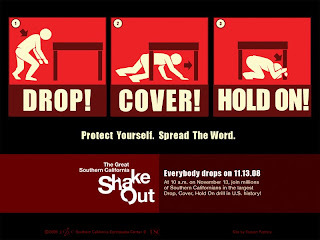 From Vromans Bookstore to PCC, thousands in Pasadena participated in the Great Southern California ShakeOut this morning. For my part, I was among the city staff who work in our Emergency Operations Center. We were there by 9 a.m. when the three-hour drill started this morning. 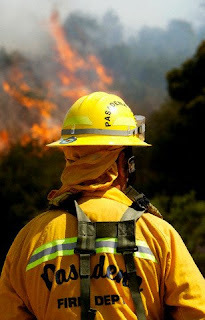 After a briefing from Fire Chief Dennis Downs and other Pasadena Fire Department officials... ...we went to work. Staff in the Logistics Section, for example, arranges for facilities, services, resources and other support. I'm part of the Policy Group, which advises and assists in making strategic policy decisions after an emergency or disaster. I don't have any photos from precisely 10 a.m. on the dot when everybody dropped, covered and held on for 60 seconds. Ordinarily our earthquake drills are very detail-specific, right down to deciding how many backhoes to request and the triage priority for first responders. This morning we didn't get into such minutia and instead focused on big picture and strategy due to the nature of the scenario. It was a worthy exercise and we're better trained as a result. Remember, if you haven't updated your emergency plan and kit yet, now's the time to do it! 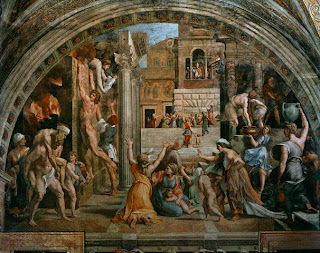 It's November 13: Do You Know What to Do? Can you help plant some trees in Bungalow Heaven this Saturday? Meet in front of McDonald Park, Mountain Street at Catalina Avenue, at 8:30 a.m.
You'll work with staff from the Parks and Natural Resources Division of the Public Works Department, who will appreciate assistance in digging holes, taking trees out of their temporary containers, planting them in the ground, doing basic cleanup, etc. Be sure to wear comfortable clothes and closed-toe shoes. If you have gloves and a shovel, bring them along, although they're not required. 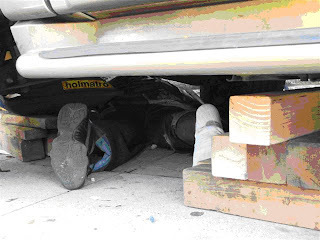 Call (626) 744-4321 no later than Friday at 5 p.m. to let them know if you can help. As we prepare for the Great Southern California ShakeOut on Nov. 13, there are a lot of questions out there, including in comments on my previous blog posting about earthquake safety. Let me debunk some myths for you. Actually, I'm not the debunker; that has been done by seismology, geology and engineering experts over the past several years. MYTH: During an earthquake, get in a doorway. FACT: There used to be a popular old photo of a collapsed adobe home with the doorframe as the only part left standing. This led to a belief that a doorway is the safest place to be during an earthquake. That's only true if you happen to live in an old, unreinforced adobe building! In all other buildings, a doorway is usually no stronger than any other part of the structure, and open doors will usually swing wildly during earthquakes. You're safer under a table or desk. MYTH: The "Triangle of Life" is the safest position to assume during an earthquake. 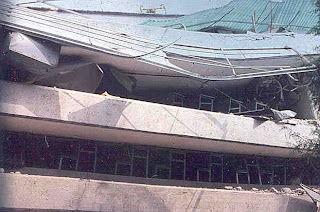 ...and a photograph of the school taken after the earthquake made one thing abundantly clear: All of the desks were still in place! If the children had been in school that day and if they had taken the Triangle of Life position, they could have been killed by falling debris. However, if school had been in session that day and they had gone under their desks, they would have survived. MYTH: During a major earthquake, the earth can open up and swallow cars, towns and people. FACT: That's a popular literary device used in novels and movies, but the fact is that the ground moves across a fault during an earthquake, not away from it. If the fault could open, there would be no earthquake. MYTH: An earthquake rupture follows train tracks. FACT: Train tracks are located on top of the earth's surface and faults are located below the earth's surface. When faults are rupturing, they don't care where the train tracks are. MYTH: There's such a thing as earthquake weather. FACT: Weather is above the surface of the earth and earthquakes begin far below. There is no correlation between the two. MYTH: Major earthquakes happen early in the morning. FACT: Some major earthquakes, like Northridge, have happened in the early a.m., but that's certainly not true of all major quakes. For example, the 1992 Joshua Tree earthquake happened at 9:50 p.m. and the 2003 San Simeon quake was at 11:15 a.m. The factors that vary between the time of day, the month, or year do not affect the forces in the earth that cause earthquakes. MYTH: There will be mass panic during the next "big one." FACT: Not if we're all prepared! Will you be ready for the Great Southern California Shakeout on Nov. 13? A local newspaper as well as several email chains have described a Triangle of Life position to be taken during major earthquakes, under the assumption that most Americans will have their homes and workplaces collapse around them. However, it has been proven time and time again, during documented scientific research, that the Drop, Cover and Hold On technique is the best method for survival in the U.S. Here's a little video the Leadership Pasadena class of 2007 made.